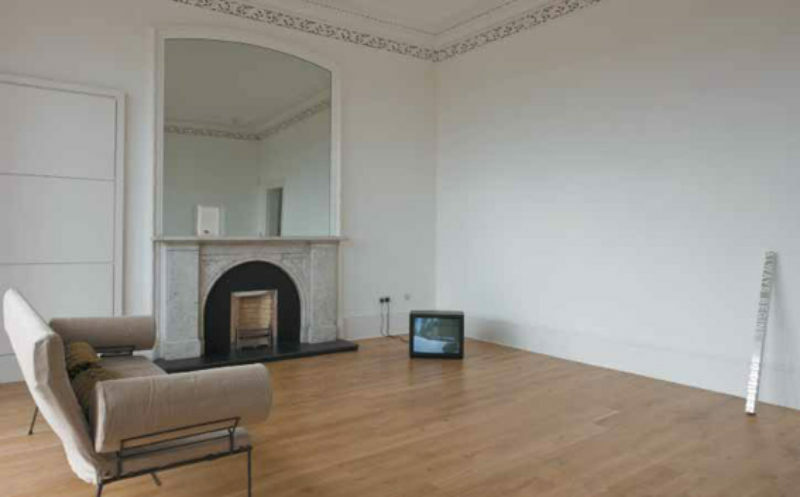 This is the first in a series of exhibitions curated by The Common Guild to be staged at Douglas Gordon’s townhouse in the Park area of Glasgow. Given that ex-Dundee Contemporary Art curator Katrina Brown is the artistic nous behind The Common Guild and given Gordon’s fame and wealth, the combination was always going to intimidate by displaying grassroots Glaswegian do-it-yourself acumen on an untouchably glamorous level. Not a case of worrying if your art school friend-of-a-friend will bring his wet paintings round in time for the hang: nor a case of hiding bikes, books and bongs in the spare room before opening night: more likely to be a case of the lifestyle paradigm townhouse with its hypnotic city panorama, combining with the allure of the exotic owner, to reinforce for the would-be-DIYer that, as fatalistically suspected, art in the big league is as remote as life in the big house. But this show, remarkably, does not intimidate, not even by accident. Brown and Gordon have not only successfully contended with the pomp and circumstance of setting and association, they have contended with the standing and character of the likes of Marcel Broodthaers and Roni Horn, Cerith Wyn Evans and Pavel Büchler. The sum total deliberately offsets the seemingly inevitable bombast and, although it still seems unlikely even now given the protagonists and exhibitors, this show can be understood as a highly subtle statement about art’s iterative and reciprocal nature. Büchler’s contagious laconic style serves this idea well. His ‘Bengal Rose’, 2005, sits on the first floor mantelpiece in a Perspex case. Forever keen to puncture pomposity, Büchler includes a hand-written note which explains the work’s utter contingency. He tells us that this rose, ‘found in art school studio on 28th November is a replacement for the last rose cut in my garden on the last sunny day of the autumn. But if you have bought the rose it’s yours and you should feel free to use it to replace any other rose or no particular rose or all roses in general. A rose is a rose is a rose’. This little artefact works well to profane the mythical status of makers, and the mythical status of things. An effective antidote to the contemporary sickness of star-struckness and object-envy, Büchler reinforces the commonsense notion that art accrues its meaning and that the accrual is very often more rewarding than the artwork itself or its creator. Marcel Broodthaers’ video ‘Speaker’s Corner’, 1972, is screened in Gordon’s library and is concordant with Büchler’s sentiment. In the short film we see Broodthaers hold up chalked commands to a puzzled crowd at London’s famously democratic Hyde Park site. The performance makes clear the ineradicable agency of the spectator, even in the face of the art star. For example, when Broodthaers displays the instruction ‘silence’ on his chalkboard, far from remaining silent one aged spectator pitches in with an enchanting version of the Christmas carol ‘Silent Night’. Roni Horn’s ‘White Dickinson’, 2006/07, delivers the wording of the exhibition title by way of an aluminium minimalist form. Horn borrowed the words from Emily Dickinson, and Brown borrows from Horn. Iteration of meaning is therefore salient once more and as touchstone for the coming Common Guild exhibitions the work might describe Brown’s modesty as curator. It is little by little that a new arts organisation will garner interest, notwithstanding the clout of readymade affiliations. The tactic of open citation in Horn’s work is repeated by Marine Hugonnier in the vestibule. Hugonnier in trademark style presents someone else’s oldish oil painting, it having been subjected to the conservation treatment identified and commissioned by the artist. A4 typewritten sheets inform us firstly of the work to be done and secondly that it has been successfully carried out. Hugonnier dispenses to us, along with large doses of humour and frustration, the idea that art-making might very well be the act of caring for something which already exists. We deduce that the big creative pronouncements of new art bombast are actually injurious to cultural health. All told, with this first instantiation of The Common Guild at Woodlands Terrace, Brown and Gordon have understandably displayed with confidence their combined internationalist reach. But the lasting impression is one of great care and attention having been paid to the possibilities of creative viewing, and, as a result, the next and subsequent iterations of the partnership appear all the less intimidating and all the more intriguing.